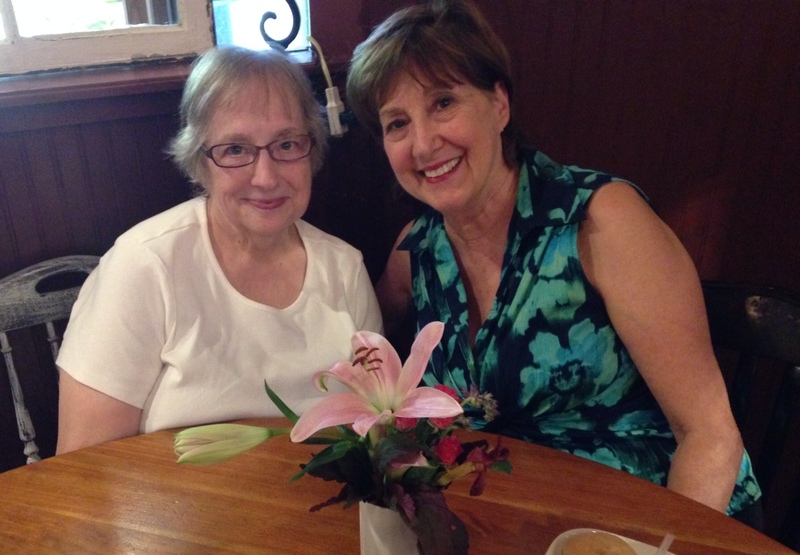 After many decades, I have reconnected in North Carolina with Gladys Graybill Schofield, whom I have known in Lancaster County, Pennsylvania since our early teens. Gladys lives in the Smoky Mountains and has agreed to be our personal guide for the evening. Who can resist! She and I have gone to Laurelville Mennonite Camp together during Girls’ Week. We were even baptized together at Bossler Mennonite Church. She still has that sweet smile I remember. This will be another adventure together over dozens of switch-backs and rough terrain to see the elk. 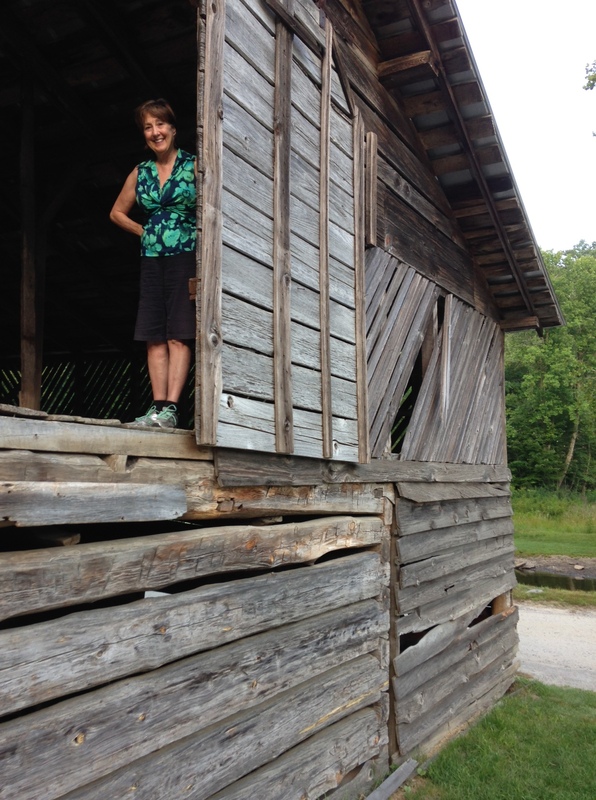 The peaceful Cataloochee Valley, surrounded by 6000-foot peaks, has preserved historic homes, barns, and churches. We were surprised to find much more than elk here in this Park. 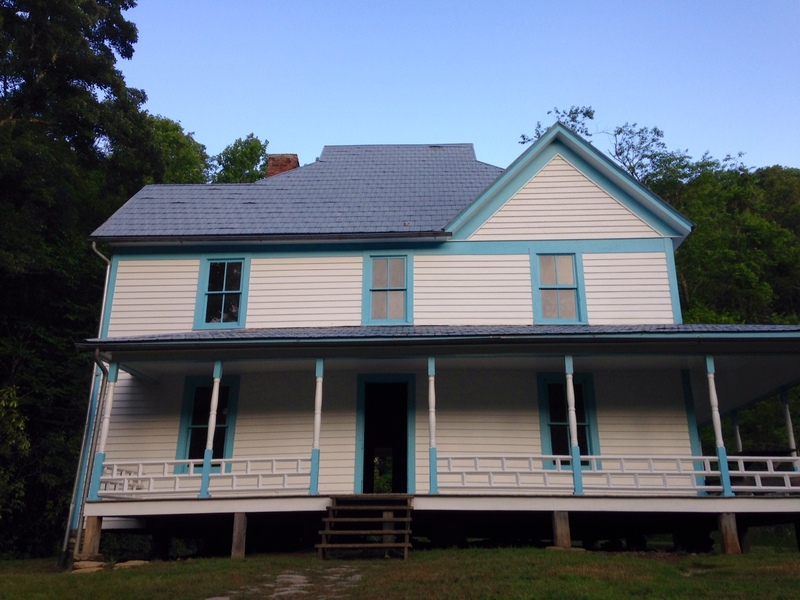 Built in 1903, the Caldwell house has no front door, grainy hardwood floors, and several hearths for an earlier family to heat the bedrooms and cook in the kitchen. It seems haunted, like an artifact in a museum – no sign of life within. We don’t linger. No elk close-up yet, so the forest ranger gives us a tutorial illustrated with authentic stage props displayed here by an old buck. Antlers fall off male elk in March and regenerate before winter. Ah, we see elk in the distance . . .
And then we spot a female grazing along a bubbling stream . 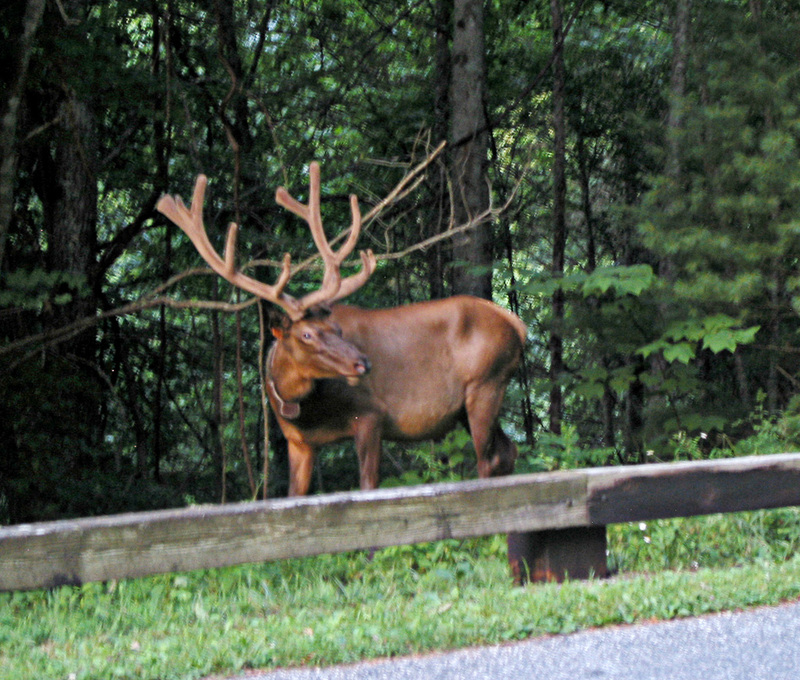 . .
Before we leave at dusk, a male with velvety antlers grazes along the roadside. Elk at 500-700 pounds are formidable creatures if they feel threatened, so we keep our distance. This bull elk will grow a new set of antlers every year. His rack is in the velvety stage in June and will be fully “mature” by the fall, attracting females in the herd. We gape, and click our iPhones. Quick! Leaving the park at twilight, Gladys and I see up in front of her vehicle a black wooly creature bounding across the gravel road and up a ravine. That you for being the first responder today, Fatima, and I’m glad you appreciate animal preservation as well. We didn’t actually have to “survive” an encounter with a bear – we just saw one bounding across the road from the safety of our car as we exited the park. I had no idea about the elk–that they had lived in that area nor that they had been reintroduced. Thank you for the lesson. What a wonderful experience for you to see them–and to reconnect with your friend, too. I would not want to connect too closely with the bull elk with those antlers–and they’re not even full grown? Yikes! He looks placid in the photo though, as does the female elk, like a cow grazing. We have lots of deer here, and sometimes I’ve seen them like herds of cattle grazing in a field. It sounds like you had a wonderful trip, Marian! You are right, Merril. 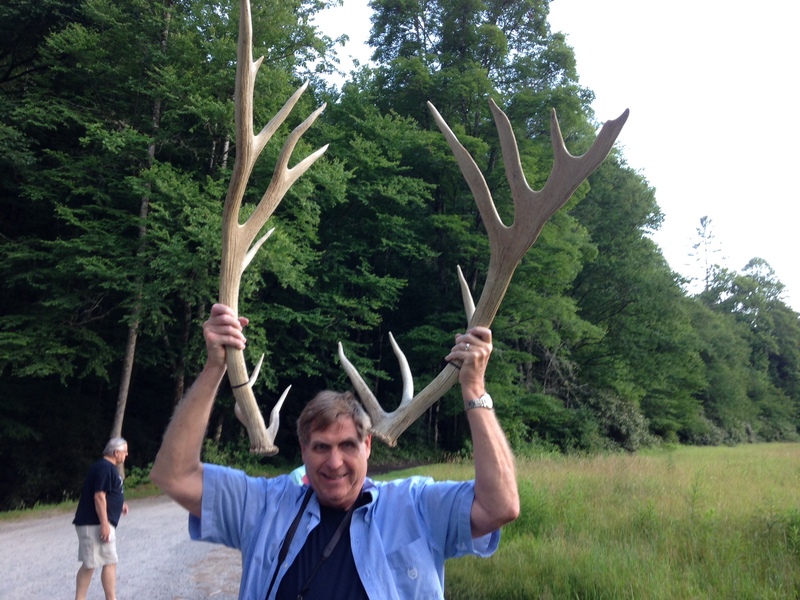 The only full-grown antlers were the rack “worn” by Cliff. I was amazed that in a few short months, the antlers went from mere buds, to fuzzy “branches,” and then bone-like maturity. At Blue Ridge Books, an indie bookstore in Waynesville, travelers could find more information about the elk, including coffee-table memento editions. I like when wild-life preservation meets tourist attraction, certainly an ecologically sound combination. Wonderful experience! It is so good to know that animals are being re-introduced to their previous habitats. It is happening here in Australia too. One always hopes it will be a success. I’m curious, Linda: What animals have been re-introduced there? My guess is that it’s not the kangaroo! Marian, there have been several native animals that have managed to survive in some areas but have died out in others, usually due to human activity of some kind. One of these is the bilby, which has been re-introduced into a couple of areas in Central Australia. An animal that has been extinct on the mainland for possibly hundreds of years has survived in Tasmania (the little state island off the south of E. Aust). It is the Tasmanian devil, and is just now being re-introduced onto at least one site on the mainland of the continent. There are others too that I cannot immediately bring to mind. But no, the kangaroo isn’t one that has had that happen. Thanks for the facts here, including the Tasmanian devil, Linda. You are certainly well informed. I’d say that nature gave you a command performance, Marian. And you got to visit and old friend and go home with an old buck. Fun times! I like the new, but old is better – in this case. Yes, and on this trip I did learn to make a distinction between bull elks and dear bucks. Marian — I love the photos and the video clip! How cool that elk have been reintroduced to the area and their population is beginning to rise. And you even enjoyed “icing on the cake” with a bear sighting. Now that’s what I call an adventure! When we started toward the mountain around 7:00 pm with rain threatening, we didn’t know how much we’d see, but we certainly weren’t disappointed. The weather held and the elk appeared. We couldn’t ask for more! So good to see a picture of Gladys Graybill after all these years. Did you discuss resemblance to mothers? Here’s to elk and more elk. No, Jean, Gladys and I were just gawking at each other and trying to catch up with each other’s lives after all these years – more than 50 actually. But now that I think of it . . . ! Thanks for noticing and commenting here, dear sister. I was there with you, Marian and found myself whispering to keep quiet when you saw the first elk. What a wonderful evening you had. I was in that area years ago before the elk were reintroduced. I will have to go back! Yes, you will Joan. The elk are propagating, so each year there are more. Besides, they are protected in a national park, so there is little danger of extinction now. What beauty !! Thanks for sharing. So much of God’s creation to enjoy in the Smokey Mts. I can say Amen on both counts. When we visited this area four years ago, I didn’t know Gladys was living there. I received a newsy letter from her just a day or two after we got back to Florida in 2011, neither of us knowing that we were within minutes of each other during our week-long visit that year. And so are you, Gladys: chauffeur, tour guide, and above all – friend! I think you are more fortunate to be able to stay in touch with such a special long term friend than even spotting elk in NC. (I didn’t know this either!) And a bear, all in one day. I’m not sure we’ve ever seen bear even in the Smokies. You are so right, Melodie. Friendship trumps all. Our neighbors near the house we were staying warned of bear sightings. One resident exclaimed that his dog paused on a trail and started growling, which he interpreted as the presence of a bear not far away. On our next walk in the woods, Cliff took a butcher knife. I think you could make up some good dialogue for how our conversation sounded after that. Ha! How lovely Marian! Such beautiful creatures and a lovely story of re-locating. Loved the sounds of the stream and the female grazing. Like the looks of that Old Buck too. And how lovely to re-connect with Gladys, her smile is extremely sweet. Lovely photo of the two of you! Thank you for looking, listening and commenting here. Yes. It was a privilege to re-connect with an old friend and learn something new about wildlife in North Carolina. What magnificent creatures! You know how to have a nice time. Tomorrow we’re putting the boat in the water and I can’t wait. Time for “Freeesh Aaaair” as Terry Gross would say. Enjoy that boat ride, away from tiny pixels on the screen. Thanks for showing up here amidst your busy writing days, SK! You had me going for a while there. I was swallowing your spiel hook line and sinker – ha! Yes, I do agree that animal was a handsome guy, but I staying withy my dear “Buck”! Your comments always get a guffaw out of me. Thanks. Cherry! What a wonderful place! And that elk is just magnificent! Though I’m not a globe-trotter like you, not so far from home we found this magnificent animal in its now-native habitat. Thanks, Fiona! Our spotting the bear as a finale sounded a little hokey, but it was actually true. I understand that elk attack bear, not the other way around as I would have thought. That’s a beautiful photo of you and your friend. What an adventure you had. Thank you for the photos and video, Marian. I happen to love moose. But after reading Gary Paulsen’s novel, “Hatchet,” I realize how dangerous they could be. In their case, they sometimes go loco after eating the water lilies (?) because of a parasite that’s in that plant. Like the elk, dangerous indeed! I’m glad you got to experience our adventure even vicariously. We kept our distance from the elk, and we were leaving the park in the security of our vehicle when we spotted the bear. I think he didn’t want to get “kilt” by a 4-wheel drive. S/he was in high gear crossing our path. Another wonderful post, Marian. 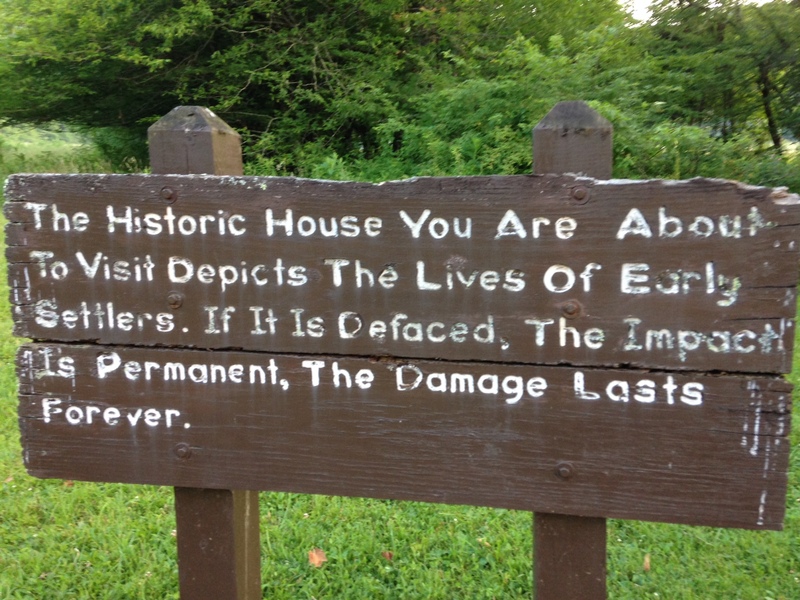 I loved being along on your adventure, and I was especially touched by the hand-painted sign about damage done would change things permanently. The elk antlers look better being held up out in nature instead of hanging from a wall. In Colordado, mule deer was found only a few blocks from our home near the Garden of the Gods, and it had died of plague. This was a week after a 17-year-old died of the plague in Ft. Collins, CO, so we’re all under watch now. I’d much rather be on your adventure! So you live near Garden of the Gods. I believe we must have visited there on our 5-week cross-country adventure, lo these many years ago. Colorado has so many beautiful sights, but I remember the wide open spaces, big skies most of all. The elk antlers were actually a teaching tool for the park ranger. It certainly caught our attention. I hope the plague you describe is under control very soon. Thank you for enjoying this adventure with me vicariously. That’s the beauty of blog posts – another slice of life. I hope you are enjoying this 4th of July weekend wherever you are, Marylin. That was quite an adventure with elk and a bear., neither of which we have here. I liked the old house but I agree it does look haunted and a little scary. 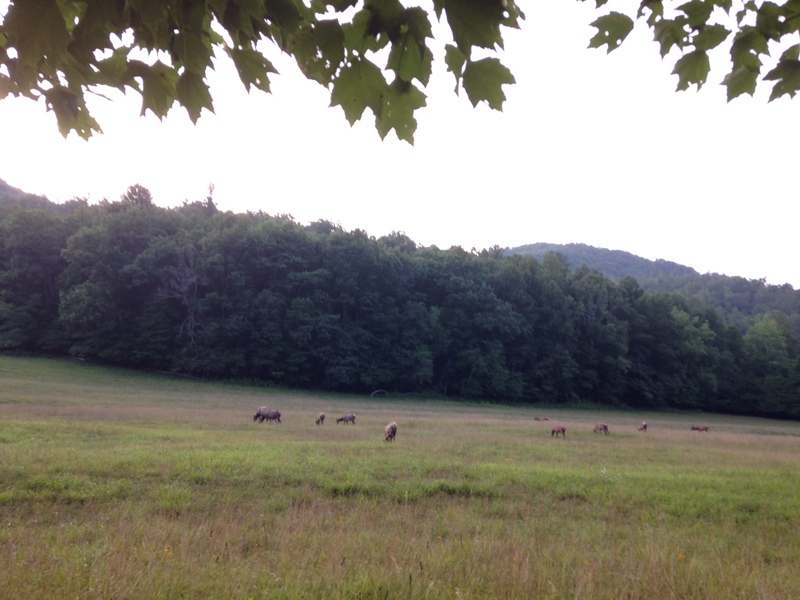 You often wander around in nature and tell us about it on your blog posts. This is probably the closest I’ve come to this theme on mine. I hope you will have a look at Creation Clips, the previous post, where we are taking a “real” walk. In fact, we walked at least a mile every day – my foot was still healing. About the house – one of the scariest things about it was the fact it had no front door and looked as though it had been recently painted – two very contradictory things in my mind. What a wonderful adventure. Elk and haunted houses and a bear for an exclamation point. I’m about to take a trip to CA for an adventure with friends. I wonder what we’ll find along the way. No elk. A parched dying Earth. But we’ll find something wonderful, too. There is always something wonderful. Great photos as always. Beware of that smiling dude with antlers. Thanks for starting me day off with such sweetness. As I read your comment about the parched dying earth in CA, some images of cacti with stunning neon colors flashed into my mind. I guarantee, if there’s something wonderful to be found (and there will be), you’ll spot it immediately.